I have to admit, I agonised over this quite a bit. I wanted to launch a blog with a name, and I wanted the name to reflect something of the blog’s mission. Blue Filter was one of the first names I came up with, and I went back to it over and over, worrying whether it would be the right thing. In fact, I worried a lot that it might have pornographic connotations, but it turns out that if you type “blue filter” into Google almost all the initial returns are related to photography, and not some form of IT child protection system as I feared! 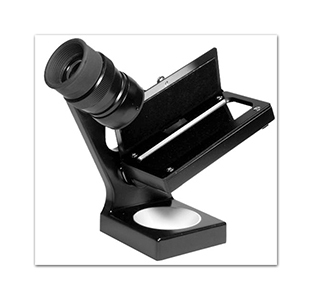 Ultra accurate tool for obtaining critical sharpness in photographic printing. But here’s the thing: the blue filter I was thinking of when I finally stumped to buy the domain was not the colour correction filter that you might expect. Nope. I was thinking of the one that you can (for which read “should”) use with this, the Peak Focus finder. Readers who cut their teeth in darkrooms before the digital age may know where this is going, but others may be wondering what the hell a blue filter would be doing here. The answer is simple when you think it through. What colour is a darkroom safelight? I’m talking the generic darkroom here – the one used for printing black and white, or if crap Hollywood films and TV shows are to be believed, any photographic darkroom? Yes, red. What does this tell you? In the real world it tells you that black and white papers are not sensitive to the red end of the visible light spectrum, which in turn tells you that they must be sensitive to the blue end of the spectrum. Generally black and white darkroom printers are taught to use grain magnifiers (Paterson seem to have cornered the market in cheap versions) to improve the focus of their negatives in the enlarger, but this is usually done under a red safelight, and a large part of the light coming through the enlarger itself is from the end of the spectrum that the paper is not actually sensitive to, and that is where the blue filter comes in. 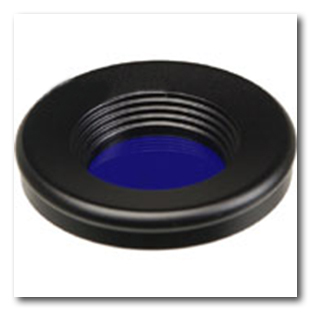 A deep blue glass filter, it fits over the eyepiece of the finder. Frankly it is so bloody deep that the first time I used one I was convinced that it must be faulty because I couldn’t see a thing through it. Perseverance pays, however, and it quickly became second nature to absorb myself in the grain structure of the negative, and it really does make a difference. After you have used one and compared the print with it against the print without, the blue filter becomes your best friend in the darkroom. Although I had thought about the relationship between B&W papers and the red safelight often, it was something I read in Photographic Printing (ISBN: 1852270152) by the acclaimed master printer, Gene Nocon, that alerted me to the existence of the blue filter and its importance. In fact, it seemed so blindingly obvious after I read it that I ordered the filter immediately – best money I ever spent in the darkroom. So, there you have it. This blog is called Blue Filter, because its aim is to bring critical sharpness to all areas of photography and photographic practice, doing so by concentrating on the part of the photographic spectrum that actually matters, and in time becoming your indispensable friend. If it fails, the fault is mine entirely, and does not in any way reflect on the usefulness of blue filters in the darkroom!